DMV.com was created to help simplify your life by providing you with all the vehicle related information and Alabama DMV services you may need, in one place. Quickly find information and services regarding driving records, vehicle registration, drivers license renewal, license plate. Learn about Alabama drivers license services provided by the DPS. New drivers must obtain a new drivers license in AL before they may drive. Requesting Alabama driving records online is fast and convenient. Order your AL DPS driving record today without having to leave your house. Auto insurance is required by the Alabama DPS for any car operated on the road. Find affordable car insurance in Alabama today. Passing traffic school in Alabama allows motorists to earn insurance discounts and more. Learn about AL defensive driving course benefits. Take an AL DMV practice exam to prepare for a license test. Passing a driving practice test improves your chances of earning a license. 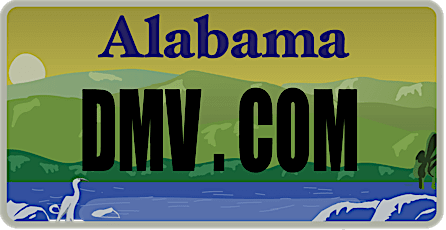 AL DMV auto registration is required for car owners. Learn to get car registration documents, renew car registration at the DMV and more. AL drivers training is required by the DMV for some first-time drivers. Learn how drivers ed classes in AL improve road skills and safety. An Alabama DMV bill of sale is an important document to obtain after you buy or sell a car. Learn how to get a bill of sale from the DMV. Alabama traffic tickets require drivers to respond or face DMV penalties. See how to pay a ticket online or how to fight speeding tickets in AL. A first Alabama DUI conviction involves penalties such as DPS license suspension, fines and prison time. Learn more about getting a DUI in AL. Before you buy a used car or new car in Alabama, consult our resources. Buying a car online makes DMV registration quick and convenient. DMV services in Alabama are available at DMV locations. Find Alabama DMV locations and hours to obtain the services you require. Are you looking for information that you desperately need and concerns the Alabama Division of Motor Vehicles? Well, you are at the right place – DMV.com, a privately owned website that has no affiliation to any government agency and saves you time and effort when looking for facts about the Alabama DMV. When it comes to motorcycles, cars, boats, getting a driver’s license, license plates, auto insurance, driving record we are unbeatable. It is very simple. There is a search feature and navigation sections at your service. Instead of waiting in lines for hours at the office, save your precious time and deal with your issue in a second from the comfort of your home. You as a reader can contribute in making the website even better by sharing your thoughts about our articles, visit our Facebook page and asking for additional tips that we are here to provide for you.